These Italian meatballs are one of my favorite dishes and are a regular fixture of our weekend dinner line-up. I'm usually to be found in the kitchen from about 5pm chopping and measuring. 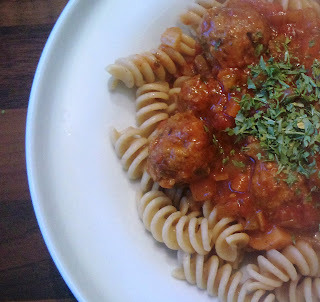 There's generally food on the table by the time the X-Factor starts, or sometimes by the time Harry Hill's TV Burp starts, if the meatball aroma is exceptionally nice! I use minced turkey to greatly reduce the fat content, but they also work fine with extra lean beef mince. The following recipe makes two generous portions of meatballs. • 2 x slices of Weightwatchers whole meal bread, blitzed with a hand blender. Add the turkey, breadcrumbs, stock cube, seasonings and cheese to a large bowl and combine, breaking the mince into smaller pieces. Next, add the egg and worcestershire sauce and continue to mix well for a minute or so. If the mixture is a little dry, you can add a small splash of low fat milk. (If the mixture is too wet, you can add a few more breadcrumbs). To shape the meatballs, I find it's best to wet one hand. Take approximately 1 heaped teaspoon full of the mince mixture and place it in the palm of your wet hand. Use the fingers of your dry hand to roll the mixture into a ball. Continue with the mixture to make approximately 30-35 meatballs. Wet your hand again a couple of times during the process. I usually store the meatballs on a sheet of tin foil, while preparing the sauce, but you can make them beforehand and store them in the fridge until your ready. The meatballs will also freeze well at this point. Add the tinned chopped tomatoes, tomato puree, ketchup, boiling water, sweeteners and stock cube to a large pot. Turn the heat to a high heat and bring the pot to a boil. Once it’s boiled, reduce the heat to medium and add the parmesan, black pepper, Italian seasoning, garlic granules, dried parsley, bay leaf and bouquet garni. Meanwhile, heat a large frying pan on a high heat and add 2 sprays of oil. 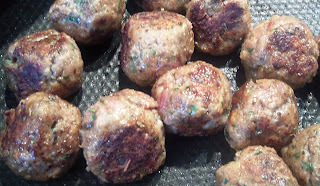 Add half the meatballs and fry lightly for 5-8 minutes until they are lightly browned. Shake the pan to ensure all sides are browned. Transfer the meatballs to the tomato sauce. Add the second 2 sprays of oil and fry the second batch of meatballs. Add these to the sauce. Reduce the heat to medium and add the mushrooms and fry gently for 5 minutes. The mushrooms should soak up any residue left behind by the meatballs. Transfer the mushrooms to the tomato sauce. Then, add the chopped celery to the pan and fry gently for 5 minutes until lightly browned. Again, you should lightly season the celery with salt and pepper. Transfer to the tomato sauce. Finally, add the butter spread to the pan and, when bubbling, add the onions. Stir gently for 3-5 minutes, until lightly coloured. Then add the garlic and continue to fry for a further minute. Add the onion and garlic mixture to the tomato sauce also. Stir gently to make sure all the additional ingredients are combined, but don't break up the meatballs. Partially cover the pot with a lid and leave to simmer for approximately 1 hour minimum, 1½-2 hours if you can stay away from them! Stir the pot every 30 minutes or so to ensure the sauce is not sticking to the bottom of the pot. When cooked, remove the bouquet garni and bay leaves. At the basil leaves and black pepper. Divide into two portions and serve with Whole Wheat Pasta. Darren, this receipe sounds amazing. I know what's on the menu for tomorrow evening! Thanks for the feedback! Let me know how you get on! Hey Darren, I made the meatballs on Sunday. They were so scrummy, bursting with flavour. Thanks for the receipe. I'mma gonna try this one this evening. Your recipes and photographs have my salivary glands working overtime here. Out to the shops now. I'll let you know how I get on. Thanks!